Wide range of food, treats, fun & foraging toys, accessories, supplements and cages for your Caique. Find everything you need to keep your Caique healthy, happy and mentally stimulated. We offer a large selection of food & treats by all major brands, Toys to fulfil the desire of your Caique to play and explore and every cage accessory you will ever need. The Caique is known as the clown of companion birds, due to their outgoing personalities and fun antics. Bird lovers alike, can appreciate their playful nature and know that Caique (pronounced “kai-eke”) can often be mischievous little birds. Which makes their families and prospective owners love them even more. 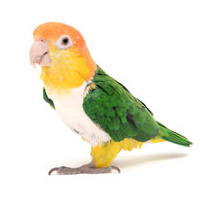 Since your Caique is such a fun little creature, it’s only fair you give him the best care, toys, treats, and accessories available. We carry all that and more, to treat your Caique like a king. We offer high quality Parrot treats and rewards for training, seed blends and pelleted complete foods - the key to a healthy diet. You can also browse our great selection of supplements that help the special health requirements your Caique may have. Our line features high powered vitamin supplements, feather and skin supplements, and even worming treatments. Pick some must-have treats like fruit jelly cups or healthy mixes of nuts and fruits. Not only will you be able to reward your Caique for good behaviour, but you’ll be providing them with essential vitamins and minerals from these treats. Keeping play time a priority is also essential when providing for your Caique. Find a great selection of stimulating toys for chewing, preening picking, swinging, and climbing. Also, find ones for foraging. Don’t let your feathered friend go bored. When your Caique is done playing, you may want to let him perch and rest. Whether you’re searching for a cage, stand, or some accessories, you’ll find yourself facing a great variety. When you cannot attend to your parrot, it’s important they have a safe place to retreat to and find comfort in. Rest assured, we provide some of the safest and most durable cages available to your parrot. Made from stainless steel and wrought iron, our cages are also coated with non-toxic paint. We carry many sizes and many feature perches, slide out trays, and even seed catchers. You may also pick from our ravelling cages and carriers, we have the perfect solution to ravelling with your Caique.